The other day I started telling you about my journey to becoming a clothing and pattern designer—about how I decided to leave my job and return to school to learn how to make sewing patterns. 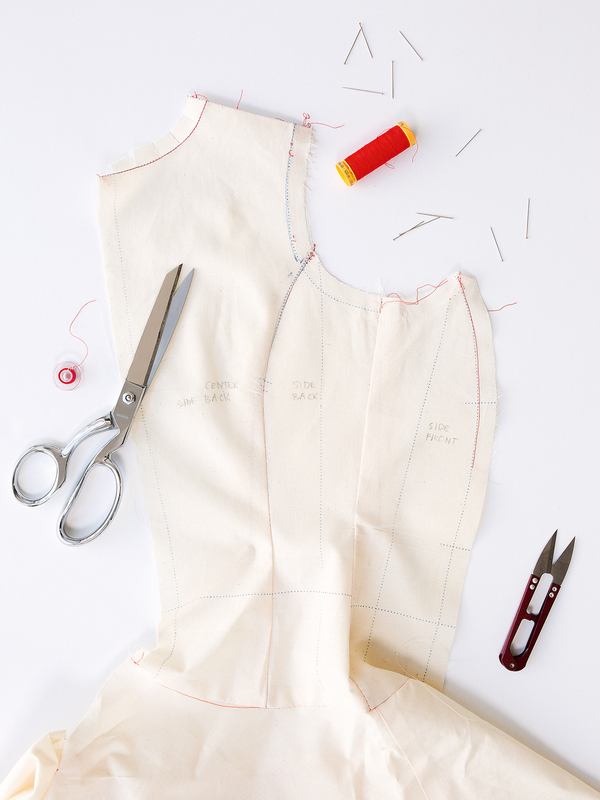 I also mentioned that I would tell you more about the method I have found for teaching the patternmaking skills I use when I develop sewing patterns. Today I’m going to do that. What we’re doing when we customize a pattern on the blog is essentially part of what professionally trained patternmakers do. All established apparel companies have a series of block patterns—patterns that fit well and that have been successful for that company. It takes a lot of time and expertise to develop and grade patterns into their different sizes. But once a pattern is completed, it can become a block pattern and be altered in many different ways. A block pattern allows the patternmaker to develop new styles without having to start from scratch each time. After all, if you have something that fits well already, why not use it to develop other styles that also fit well? This helps to create a consistent fit for a brand. When they are working from block patterns, patternmakers are really just using their skills at customizing a pattern—their block pattern. Once they have a block developed, they do riff after riff on that base style. 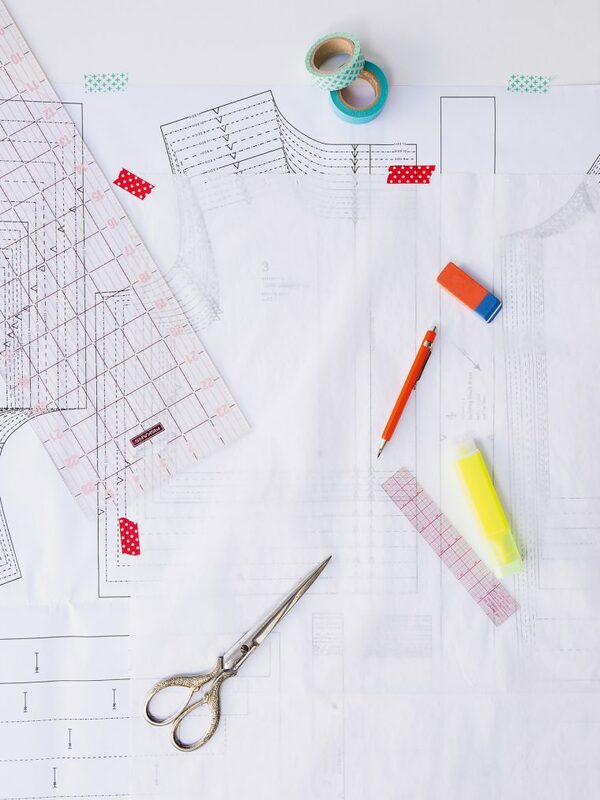 Knowing how to customize all the major elements of a block pattern gives patternmakers the ability to develop almost any style they can imagine. Start with the block dress pattern but add a Peter Pan collar and pleats to the skirt. Voila! A new style is born. Does that make sense? So here’s what I realized. If I created a really good, high-quality block pattern for you, I could show you how to customize every aspect of it—piece by piece, step by step. And if I did this in a really thorough way that included detailed sewing instructions as well, working through all the possible elements of the block and showing you how to customize each in multiple ways, you would be able to do what I had wanted to do when I first moved to New York, before I went to school to learn patternmaking. You could design your own garment, develop the pattern for it using that block pattern as the starting point, and then sew the finished style. So with this block pattern and set of customizing instructions, you would be able to design and make patterns of your very own—in the same way that professional designers and patternmakers do—without requiring years of study and experience. And without starting from scratch each time. Sound complicated? It’s not really. I know you can do it because that’s what we’re doing all the time on the blog with our customizing tutorials. Since I really wanted to teach you these skills, and I could see from your responses to our tutorials and from the questions that you’ve been asking over the years, it made sense to put it all together into one big package. And the best package for it would be a book. But let’s stop for a minute and talk about craft books. Have you noticed that a lot of people write one and never write another? I’ll tell you why. Today, writing a craft book doesn’t make financial sense for the author. Most people write a book to help make their name or brand more visible. It’s sort of a calling card; if you’ve written a book you have a certain amount of cachet. People are impressed by book authors. You can do book signings and hold events and people will take you seriously. But in truth, authors make very little money from a craft book. It took about two years to write my first book, from the time I started actually writing and drafting the patterns to the point where the book was finally finished and went to the printer. That doesn’t include the time I spent conceptualizing the projects or marketing the book when it was released. The final book included 20 complete sewing patterns with detailed instructions for each. That’s about five years of new Oliver + S patterns for us. Most books sold today are purchased on Amazon at a price well below the publisher’s suggested retail price. And that discounting works its way all the way back to the author’s wallet. Do you want to guess how much I make when a copy of Oliver + S Little Things to Sew (suggested retail price of $27.50) is sold on Amazon? I’ll give you a minute to think about it. Close your eyes and come up with your best guess. Go ahead. I’ll be here when you come back. OK, I’m still here. What’s your guess? Ten dollars? Five? Three? Nope. For each copy of my book that’s sold on Amazon, I earn 55 cents. That’s it. And that’s not because Todd negotiated a lousy deal for me when we contracted with the publisher! Those are the standard economics of the book industry today. They still work out pretty well if you’re J.K. Rowling. But not if you’re writing a craft book. But I really wanted to write this book. In fact, I obsessed over it for a long, long time. So finally we decided to go ahead and do it. Ourselves. Because that was the only way we could possibly make this project work. So for this new book we did everything: from writing and illustrating to photography, design, printing, and distribution. Just like we do for our sewing patterns. It was an exciting challenge for us to do it this way, but it also enabled us to justify writing another book because we are the publisher and we are able to earn that much more for each copy sold. But I’ll be honest. It’s scary to know that I’ve invested a couple years into this project and that we have committed to printing thousands of copies of this book before we’ve sold any of them. To a certain extent, we’re putting the company on the line with this project. It’s been two years of our time, and we’ve invested a good deal of the company’s finances in this project. But we love a good challenge, and we don’t shy away from risks that we’ve been able to evaluate intelligently. We felt so strongly about this concept, and about giving you the tools to become a designer yourself, that we decided it was worth it. And we’re hoping that you agree. The result of all this work is a unique guide that will take you through every aspect of designing a dress, to altering the pattern, to sewing it. And it won’t require you to quit your job and devote a year of study to be able to do it. I’ll show you how it all came together and what the final book looks like on Thursday. I can’t wait! Can you? This is wonderful news, and I am really excited to see what you came up with! The anticipation is too much! Very excited for the big reveal! I admire you and your work so much. Thank you for your candor! Additionally, you’re a brilliant pattern maker and all around guru…I’ll be buying your book straight away. The concept sounds awesome! I can’t wait to get my hands on a copy! I will look forward to it! Good for you on keeping on with that vision for the book! Thank you for being so open about the economics of craft books! I’ve been aware of this for a while, but I hope it helps more people understand why publishing a book is not always best for crafters. I’ll be curious to see how the self-publishing route works for you! Wow, awesome. Your story, the concept, the way you speak so openly about it. How great to invest so many thoughts and all this time and energy in a project that could lift the whole sewing community on the next level. It’s exciting and I can’t wait to become part of it!! I wish you loads of success with this project, I can’t imagine this could not work though. Thank you so much for this gift! Thank you so much for doing this Liesl! Can’t wait for the book! Rebecca, the book will go on sale next Monday. But you’ll get more details on Thursday. I’m so excited, almost speechless. Thank you! I am so excited about this book! I love that my daughter and I will be able to dresses for her together, and I’ll actually be able to use your book to draft the actual pattern. Exciting news. Your patterns are so well drafted. Look forward to learning from a Master. I am thrilled about this book and pre ordered it the minute I heard about it. Can’t wait for it to arrive at my door and start using it. I have been drafting, customizing and trying to do a basic block for myself for months not successfully I might add and I know this book is going to help me get where I want so I can create perfectly fitted clothes for myself. Will save me lots of money and time going to design school which I was considering doing. Thanks for all the time and effort you put into this book. I love your patterns and instructions and can’t wait to order the book. What a great concept! Congratulations on seeing your vision to reality! Looking forward to Thursday and the reveal. I want to get back into garment sewing but my old patterns are undersized and outdated. In other words my figure changed some after raising 3 children and grandparents. It’s so interesting to learn everything that goes into making a book and your past and why you were inspired to write this book. It’s all very interesting. I know the book is going to be amazing! What a wonderful news !! I will count minutes until Thursday ! How amazing. I love love love your patterns (child and adult) and been desperately looking for a book on how to draft your own patterns. Please please please sell these in the UK! Oh my…! very interesting post…you guys are really brave! I guess the new book is a jewel. Waiting for thursday!! This is so exciting for you both!! I will certainly be buying a copy for myself and cannot wait too! Thank you for sharing the process with us as well. I think we take pattern making and book writing for granted these days. I will be very interested to read your book when it comes out. It is such a shame that the producer (writer) does not get a greater portion of book sales. I have been told that printing costs don’t even take up that much of the cost. So where does the money go? $28 for a book is a fair chunk of change you to get only $.55 from it. Karen, everyone involved in the value chain gets a slice of the final sale pie: author, publisher, printer, and seller. Unfortunately, when the book is sold at much less than suggested retail, the pie gets much smaller–which means that everyone’s slice is smaller. And the author’s gets even smaller still. This post has made me even MORE excited for your book. So very excited! is this for a woman’s dress or a girl’s?? Guess I’ll have to wait and find out! This is all so very interesting! I’m in! Look forward to the big reveal! This is wonderful news – I can’t wait to purchase a copy! Self-publishing can be risky, but so much more rewarding, and not just financially, as it gives you control over all aspects of the publication. You have a strong brand and an existing customer base and your subject matter clearly meets a demand. I’m sure that it will be a resounding success for you. I love this whole thing, and signed up for your class in Seattle just this morning. Where?!!! I am in Seattle and would die to meet Liesl! She will be teaching at Drygoods Designs. More information on that will be on the blog next week. Hooray! This is exactly what I was hoping your next book would cover. Thus far in sewing classes I have learnt to make a skirt and a top block but I am still learning how to use them. My prayers have been answered! Thank you! Buying two copies on Thursday. One for myself and a friend. Can’t wait! I hope the self-publishing route works for you. I can’t way to get my copy – I do have a couple of books on pattern drafting but they didn’t work for me – old fashioned patterns, poor instructions (if any). It’s something I really want to learn (properly) for quite a long time. Thank you so much for sharing your knowledge! Oh my goodness, this is exciting! I daydream about learning how to master garment fitting and there is no one I would rather learn from than you! S. O. L. D.
Exciting! I’ll be buying your book and giving one as a Christmas present. I understand completely your point about the way it works when you’re faced with the problem of distribution vs profit. Clearly, someone is making a profit — but it’s rarely the author or creator, and this situation holds for most of the creative industries. I’m happy to buy from you direct and to cut out the middleman. Your books sounds like a great idea and I’ll be in line to get it. This is exactly what I’ve been wanting to learn but had no idea/time to begin. I hope this self publishing is very successful for you. Thanks for sharing the behind the scenes and sharing your knowledge with us. I buy a lot of craft books but I rarely use them. They are good idea books but my completed project is disappointing. Your book is the exception. I have completed so many of the projects because your instructions are very user friendly and the end result is pleasing. That tells me how much time you spend making the projects workable. One of my favorites is the cape. My granddaughters love their capes and have received many compliments. When I first started reading your post I got a lump in my throat because I thought you were going to say, “No more books” and I have been anticipating a new book in September. So, yea!!! Count me in. So what you’re saying is that I can’t challenge myself to sew this book from cover to cover because the possibilities are infinite, right?! That’s a ‘darn it’ and a ‘yippee’ from me. Come on Thursday… Hope you’ve hired extra post packers. Sure, it will be possible for you to sew cover to cover through this book. You’ll just need to make more than 60,000 dresses to complete the job! But you’re always up for a challenge, aren’t you? So very excited about the release of this book!! Such a phenomenal concept . . . and graciousness on your part for sharing that knowledge base with the rest of us. THANK YOU, THANK YOU, THANK YOU for your generosity!! I absolutely cannot wait! I just know your book will be hugely successful, and it will be worth all your and your family’s time and effort. I plan on attending your class at Craft South!! Yay! Want to order it now! Thank you for this! Will you offer your courses again some day? Liesl has a whole series of them planned. Stay tuned to the blog next week for details…. I can’t wait to see inside your new book! I really hope the methods will apply to fitting women’s clothing — not only since that is most of the clothing I sew but because it is much more complicated than fitting children’s garments. I had pre-ordered your book from Amazon but after reading the end of your story I decided to cancel my pre-order and will buy directly from your website. I hope to do my part in keeping your business going strong! Thank you so much Catherine! Your act of kindness and generosity is very much appreciated. Really exciting news Liesl. I really enjoyed your fitting class at Guthrie & Ghanie earlier in the year – you made the complex fitting process so straightforward. Sounds like your new book will take those skills to the next level. Can’t wait to hear more on Thursday! Put me down as a guaranteed sale. This is fantastic! Will this be adults or childrens???? (Yes, I know — once you have a block pattern & know how to make your changes it doesn’t matter — but still — are you starting with a children’s block or women’s block? Because obviously women’s block has bust shaping, etc. not found on children’s block). This one is children’s but the techniques are applicable for adults. Liesl will explain more in her blog post on Thursday. This sounds very exciting, both for you as for us! I can’t wait to see the final product! I couldn’t be more excited! Can’t wait. Already pre-ordered this one and will be anxiously awaiting it’s arrival at my door next month! Was hoping it would be adult clothes but, all help is important & a good learning experience. The block pattern included with this book is for children, but the alteration techniques can be used on ANY pattern–including adults patterns. So if you have a pattern in your size that you want to use as your block pattern, you can do that and make all of the alterations to it that Liesl shows in the book. I am super excited. I hope that you both/either write a blog post on your experience self publishing. Such an new and interesting skill set you’ve added to your business portfolio and I would love to hear more about that experience as well. I have a friend who is a NYT best selling author. Chatting on FB, she mentioned that she gets greater royalties for ebooks than paper. Which is super hard, because when your friend is the author you want the paper, but you want to maximize her creative endeavors. You also want to give the book as a gift, which I have done many times over, but you can’t give an e-book as easily. There are no wrapping and ribbons and surprise. Of course, I understand that a craft book is even harder in the ebook category. But I am happy to hear that self publishing may/should increase your return. If you guys can’t support yourself on your company, we can’t enjoy your patterns for years to come. Yes! I totally want to pre-order a copy of this. It is exactly what I’ve been wanting for a long time. Congratulations! I love your patterns not just for the designs but for the thoughtful instruction. I’m so excited to buy this book! Recently I have taken my apparel sewing in a more Scandinavian-themed direction. Now, with your new book, I can see all kinds of possibilities popping up. No more having to translate–and then modify anyway–an expensive pattern in Danish! Can’t wait! Wow! This is such great news. Kudos to you for taking the leap of publishing yourself. I am super excited about this book and will definitely be ordering one. Congratulations on this endeavor, and I wish you all success. I still have all my books from when I majored in Clothing and Textiles and am so happy you are bringing this directly to those who wouldn’t have a chance to get this info any other way. Very much looking forward to this book. I am assuming that because you will working with your own measurements, that the size range will not be quite as limited as Liesl’s patterns currently are? Tracy, the pattern alteration techniques taught in the book will allow you to make the same alterations to any pattern you own. So if you have a pattern that you like that fits you, you can use the alteration techniques Liesl shows you to make modifications to that pattern. I haven’t been this excited since Christmas when I was 7! Put me down for a copy directly from the website. Thank you for doing this! I have loved using your patterns for my littlest girl. I’m a few days late reading the blog so didn’t respond to the earlier post, but I started customizing in the 90’s when my older girls were little. I would have some vision at 9 or 10 at night, no internet, no open fabric stores; so I would start drafting from some basic little girl square yoke and go from there. Wow I feel completely honored that you have written this book! What a gift! I was planning on pre-ordering from Amazon but after hearing your story, I will definitely wait to order from you directly. I can’t tell you enough how much I love your patterns and instructions. You are amazing! And please provide an easy way for us to share your book with others (an easy link so we can email our sewing friends). Thank you so much!!! Jenny, thanks for your kind words and your support. There is a sharing button on the product page for the book. You can use that to email links or to share to any of your other social media accounts. Sounds great, I’m really keen to buy your book! Katie, if you have a basic block pattern for your doll clothes, you will certainly be able to use these same alteration techniques on that. Thrilled to hear and cannot wait to purchase! I have just started my sewing business in my small town and in just a few months I have gone from mainly alterations to mainly sewing custom clothing for my clients, sometes designing from just a photo they show me and ask “can you make this for me?”. I have managed with some success but your book will be INDISPENSABLE to me! It’s almost Thursday! Very excited about this….I love being able to support a fellow F.I.T. alum! Hats off to you for the courage to go after your vision. Hope its a total success! Good for you Liesl. It’s definitely a rapidly changing marketplace your business is in and I think, once again, you’ve tapped into a need. I’m sure it will sell well. Having studied pattern making I do work from my own trusted pattern blocks and love the process of designing new details. Can’t wait to see what your book looks like and I, for one of many, would love to support such an important player in this market by buying your book. I anticipate a re-run in your future. It’s already Thursday afternoon in our part of the world 🙂 Can’t wait! Can’t wait! I took an online course recently so that I could draft a sloper to my own measurements and I felt really successful. But I have no idea about how to properly add design elements and change it up. So excited to have a book on the way that will me teach me the next steps – especially from a person who makes such extremely good and organized patterns. I’m gonna ordernon Monday for sure! Dear Liesl and Todd, when you two told us that you were planning a new book, I thought (and hoped) that it might contain tips/sewing instructions; and reading your latest blog posts have put me into a fever of anticipation. Recently, a good friend gave me your previous book, and I was delighted to see the clear illustrations and instructions that characterise the Oliver + S patterns, throughout the book. I have studied pattern drafting, and it will be a joy to adapt your distinctive styles to my ever-changing ‘clientele’. I wish you both all the very best with the book’s sales, and hope its profitability will reward your hard work, and creativity. I am so glad you are doing this! This is just what I’ve been looking for! Awesome! I can hardly wait to buy a book!! And your subject matter is just what I need! Thank you even though it has been a long hard road for the two of you! YAS!!! First, I put in my email. Want want want. Second. I looked at the pictures of some of the dresses. There is one in there that I saw a picture of MONTHS ago. As a matter of fact, I though that that dress pattern was going to be in the Spring 16 release and then there was no Spring 16 release. Boy was I bummed. Because I was waiting for that pattern to make my daughter’s Kindergarten dress and put it off waiting for the release that never happened. I had to do something else. OOOH I was so darn bummed. Miffed even. (Spoiled right?? I’m such a baby! LOL. Gimme my O+S patterns! I want my patterns. Hahahaha ) I just really wanted that pattern and spent months looking for something comparable and did not find anything that made me as happy as that picture. Yipppeeeeee. Now I get it in the book, so I will get MORE than I wanted! Congratulations on the new book. I’m curious if you’ve chosen to do print-on-demand through Amazon CreateSpace or if you’ve contracted with a printer to have the books printed. If you’re printing them, I’m wondering about distribution. Are you working with a distributor or will they just be for sale here on your site? Thank you! I completely get where you’re coming from. I too am (was) a craft book author ( https://www.amazon.com/Micro-Macrame-Beaded-Designs-Jewelry-Crystals/dp/0312380852 ) and I wrote only one book because A. I have a good paying day job B. The incentive to spend that much time again writing another book wasn’t there for me C. The kind of advances from publishers that craft book authors tend to get for all their hard work just wasn’t going to be enough to sustain me without that full-time day job. It became much more feasible for me to self-publish craft tutorials of single jewelry projects, and more lucrative, too! I loved reading this. I have been in the same boat. During the recession I had publishers asking me to write a book and at the time I was dealing with the break up of my 20 year marriage, inadequate income to pay the mortgage and teaching to pay the bills. I couldn’t take a year off teaching to write a book. Fast forward 4 years later, with no supporting income I could definitely not go the traditional publishing route to take time off to write a book, but my students needed one. Luckily I have graphic design skills, so I wrote, designed and self published my first book with print-on-demand, because I didn’t have the investment money to print an edition. It has gone really well, I couldn’t have it done it any other way up to this point. I feel bad the publishing industry is struggling in so many ways and more people are opting out the way we have, but with the economy so imbalanced post-recession a lot of changes in many industries are happening and we have to get creative with new ways to bring in a living wage.